Fish and coleslaw served with a side choice of fries, baked potato or mac-n-cheese. All meals include beverage and dessert. 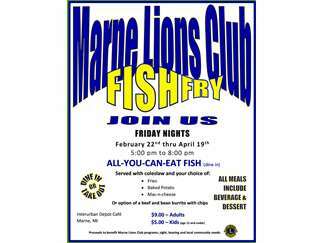 Proceeds to benefit the Marne Lions Club programs, Aid for the sight and hearing impaired and our Local community needs. Thank you for your continued support!